In this video we will discuss about using TemplateField with GridView control when editing data. Please watch part 20 of asp.net gridview tutorial before proceeding. By default, when editing data, a textbox is rendered for all the bound columns. It would make more sense to use dropdownlist as the editing interface for "Gender". To achieve this we have to use a "TemplateField" instead of "BoundField" for "Gender" column. This can be very easily achieved using the deisgner or directly thru the HTML source. 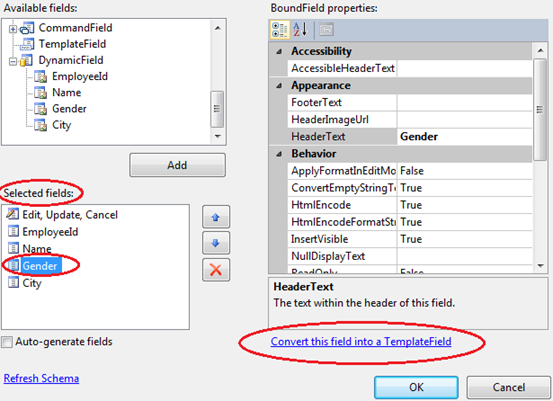 Step 2: Click on "Gender" from "Selected Fields" section, and then click on "Convert this field into a Template Field" link and finally click OK. Step 4: From "Display" dropdownlist, select "EditItemTemplate". Replace the "TextBox" control with a "DropDownList". Step 5: Now click on "Edit Items" link from "DropDownList Tasks" pane. Add the 3 listem items (Please Select, Male, Female) to the dropdownlist and click OK. Finally click on "End Template Editing" from GridView Tasks pane. Now run the application and click on EDIT. Notice that, "Gender" DropDownList always has "Please Select" as the selected item. This is incorrect. When the row is in "Edit" mode we want to have the correct "Gender" selected. To achieve this follow the instructions in Step 6 below. Step 6: Now flip the webform to HTML source mode. Set "SelectedValue" property of dropdownlist as shown below. Steps 1 to 6 has converted, the gender bound field to template field. 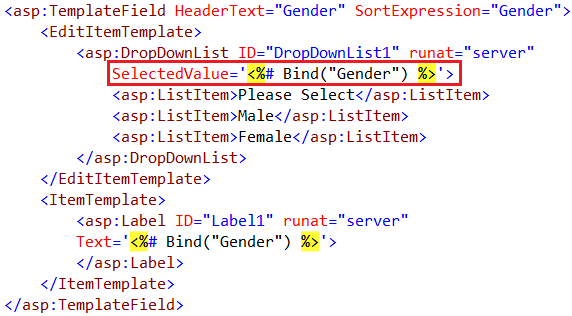 The template field HTML markup that is auto-generated is shown below. Now run the application and click on EDIT. Notice that a dropdownlist control is now used as editing interface for gender column in the gridview control. you have to select "Edit Data Bindings" property of Dropdownlist. then you will get that property. Hi Venkat, I am Sanjay. This tutorial is very.......... nice. Your way of teaching is very nice. i want to ask one question. How can we update or delete multiple record into database using gridview, can u upload this video please. can you pls help me out.. 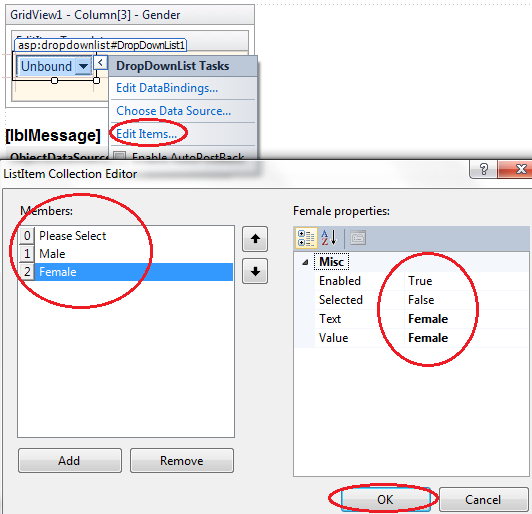 In DataBase, Change your Data Type of Gender Table to "varchar()".